Ferronyl with Vitamin C seems to be the iron supplement that works for me. Every time I try to change to a local store brand I start feeling tired again. Douglas Labs' Ferronyl with Vitamin C is an iron supplement that features vitamin C in addition to some essential vitamins. Iron is an essential nutrient that plays a role in many biochemical functions since it's present in all of our cells. Douglas Labs' Ferronyl with Vitamin C is formulated to help support iron's most famous function: blood cell health. If iron levels are low‚ then red blood cell (hemoglobin) production will be inhibited. Since red blood cells are responsible for helping transport oxygen from our lungs to wherever our body requires it to go‚ then low iron levels could result in some potential health risks like anemia. This condition is characterized by a low red blood cell count‚ resulting in easy exhaustion‚ constant fatigue‚ and more. 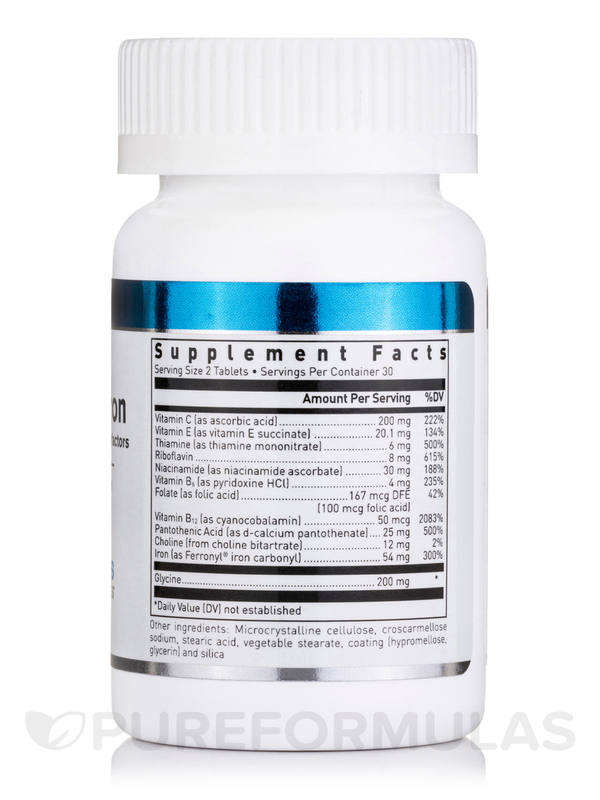 In order to fully optimize Ferronyl with Vitamin C's support of blood cell health‚ this dietary supplement features a number of B vitamins like B3‚ B9‚ B12‚ and more. Maintaining adequate levels of these essential vitamins works to deter the potential onset of anemia since our blood requires - just like iron - a certain amount of these nutrients in order to maintain blood health. 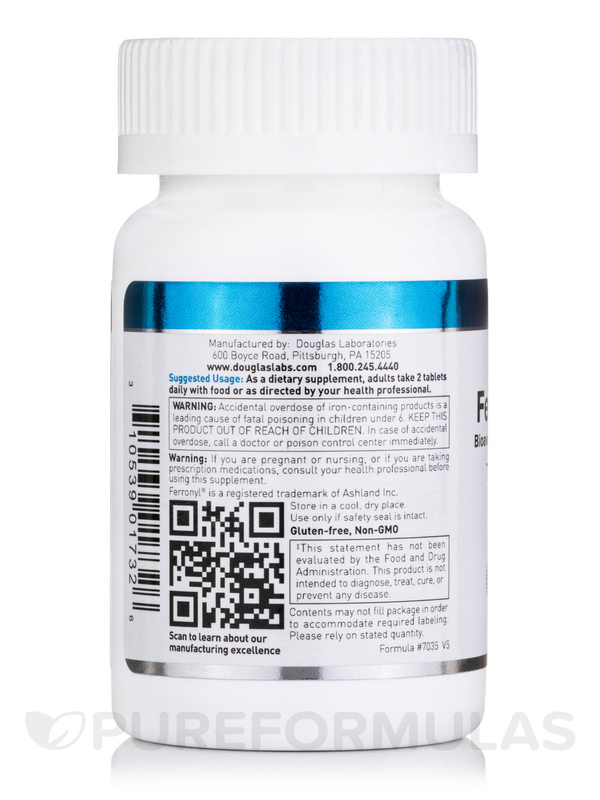 Now‚ the reason these Ferronyl Tablets feature vitamin C is because this essential vitamin - that's usually associated with boosting the immune system - optimizes our body's iron absorption from dietary sources. 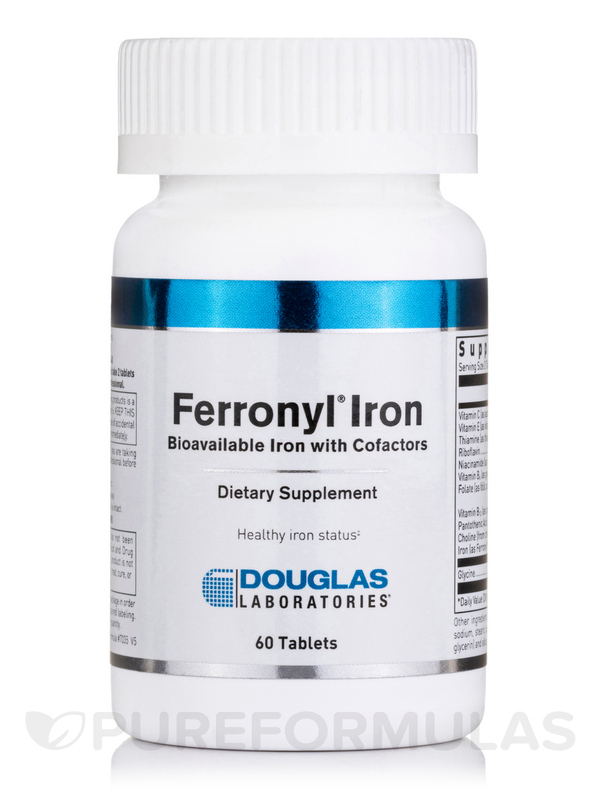 Sometimes you may be taking in enough iron‚ but your body may not always absorb it as efficiently as you need it to‚ which is why Douglas Labs Ferronyl features vitamin C.
Talk with your healthcare practitioner to see if Ferronyl with Vitamin C is something that could help you. Other Ingredients: Cellulose‚ silica and vegetable stearate. Accidental overdose of iron containing products is a leading cause of fatal poisoning in children under 6. Keep this product out o reach of children. In case of accidental overdose‚ call a doctor or poison control center immediately. My ferritin levels are going up!! I have been suffering from very low ferritin levels for several years. I have tried many other supplements and nothing has worked. One supplement even caused my levels to go down. Ferronyl with Vitamin C by Douglas Laboratories has increased my levels in just the short month I have been on it! I am less tired, I can think clearly, I am sleeping better. This product causes no stomach upset or constipation for me. I am re-ordering today! I was diagnosed severely anemic 1& 1/2 yrs ago after going to the emergency room with tingling, extreme fatigue and shortness of breath. I thought I was having stroke symptoms. Turns out my iron and hemoglobin were dangerously low and my doctor put me on horrible Ferrous Sulfate iron pills. Immediately the constipation started as well as severe nausea if I didn't eat enough food before I took them. After a few months of this I started looking for an alternative. I searched PureFormulas iron supplements and I liked the ingredients in Ferronyl with Vitamin C by Douglas Laboratories so I ordered it and thank God, it saved the day. My energy and iron levels increased tremendously without the dreaded side effects of ferrous iron. It works and I can take it with or without food with no pain or nausea. Ferronyl with Vitamin C is easy to swallow. And does not give stomach irritations. I would like to find it locally as I dont like on-line buying. I would like to find it in a larger quantity as I take two a day so one bottle is only a 30 day supply. 1. My doctor told me to take 325 mg of iron twice a day. What is the equivalent dose of Ferronyl C? 2. Can I take magnesium when I take iron? Thank you for reaching out to us, Jennifer. This is a question that your trusted healthcare practitioner would need to answer. They would be able to give you the best response possible since they’d be familiar with your particular health history and needs. 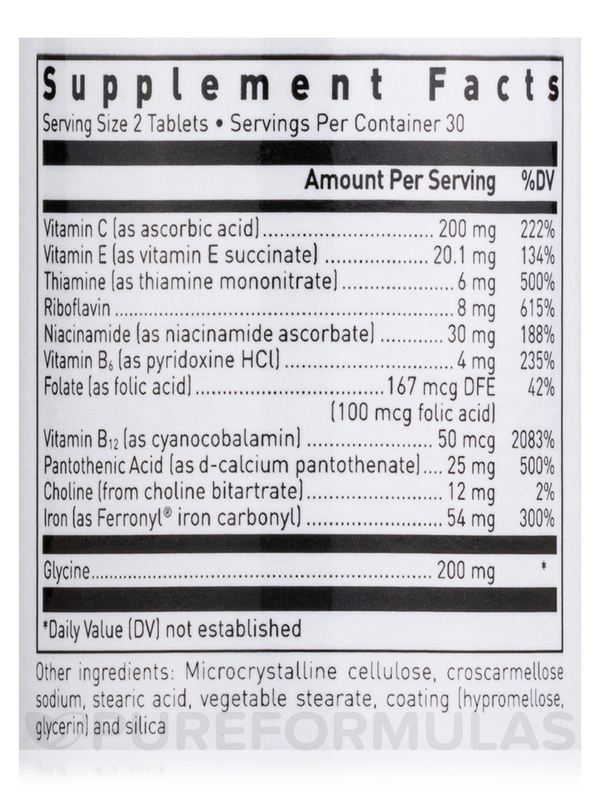 This supplement contains Vitamin B12 but it doesn't say what form. 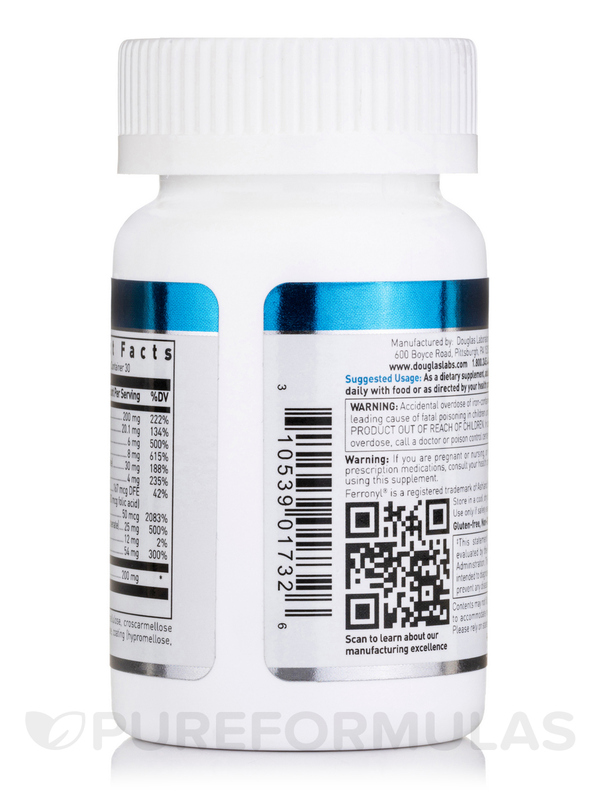 Can you tell me which form (cyanocobalamin, methylcobalamin, hydroxocobalamin, or adenosylcobalamin) is used in this product? Thank you.